The concept of the Coordinated Entry System (CES), which was launched by the Home for Good initiative of the United Way of Greater Los Angeles, is to create a comprehensive system to quickly and effectively match homeless individuals throughout Los Angeles to housing and services. The Trust has seen a great deal of success in the first implementation round of the CES, developed through the collaborative efforts of policy makers, funders and members of the community of providers of Permanent Supportive Housing in and around Los Angeles. The CES is “where different agencies from the same community can finally come together and house the most vulnerable,” explained Raymond Fuentes, Housing and Leasing Placement Manager at the Trust, who was involved in the System’s first pilot project. 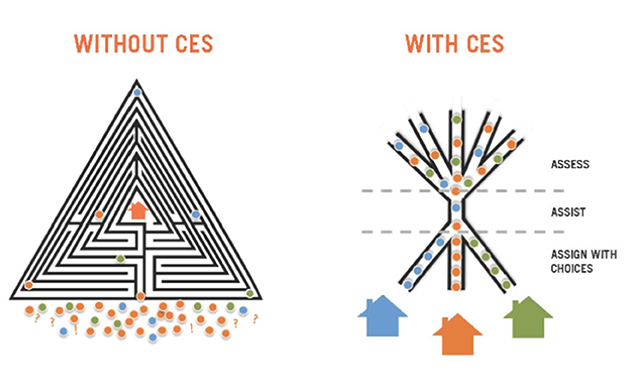 Under the CES, there are certain designated entry points for people looking for housing. For the Trust and the Skid Row community, LAMP Community, Volunteers of America and Downtown Women’s Center serve as the points of entry. 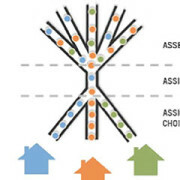 Once people pass through one of the entry points, their needs are assessed using a prioritization equation based on several factors, including mental illness, medical utilization (visits to the hospital and ER), time homeless and medical vulnerability. This score determines a person’s place on the list for obtaining Permanent Supportive Housing. The list is shared among all of the partner organizations, which saves the hassle of each organization having a separate list and possibly doing duplicate work. With CES, every chronic and vulnerable homeless person has an assigned navigator, who focuses on the needs of the client and helps them fill out the required paperwork. They are then matched with available housing in the database, culled from housing and service providers, according to their specific needs. This saves housing organizations like the Trust from having to recruit residents, and homeless individuals from having to check on the progress of their housing requests. There is also a greater focus on outreach in the community and teams regularly engage homeless individuals in desperate need, but not actively seeking services. According to Fuentes, the average time from point of entry to move-in has been around 10 to 20 days. As it is being increasingly used in the rest of Los Angeles County, partner organizations continue to work out the kinks and improve on the efficiency of CES. “It’s been a good experience and it’s a lot better than what we had before,” added Fuentes. He has especially appreciated the collaborative effort of partners working together to identify and find homes for the most vulnerable.